Do you have a busy schedule? Do you get up in the morning with hardly any time for breakfast, and get home at the end of work feeling too tired to cook a meal? One major obstacle to eating healthier is that it usually requires cooking. And expending time and energy on healthy meals when you’re already rushed, stressed out, and exhausted can feel so overwhelming that you head for the nearest McDonalds instead. So why make healthy cooking a priority? Because your health is worth it. Don’t worry though. If you’re strapped for time and energy, these 16 meal ideas are not only healthy – they also take much less forethought and prep time than you might expect from healthy meals. I’ve split them up by category: breakfast, lunch, dinner, salads, and dessert so that you can quick reference this post for the type of meal you need. Whole grain oats are fantastic for your health, but who enjoys plain oatmeal? There are a lot of great ways to make oatmeal taste better, including most of the fruit and nuts out there. So why bananas? Well, aside from the fact that they’re delicious, bananas are also a decent source of fiber and a powerhouses of potassium. 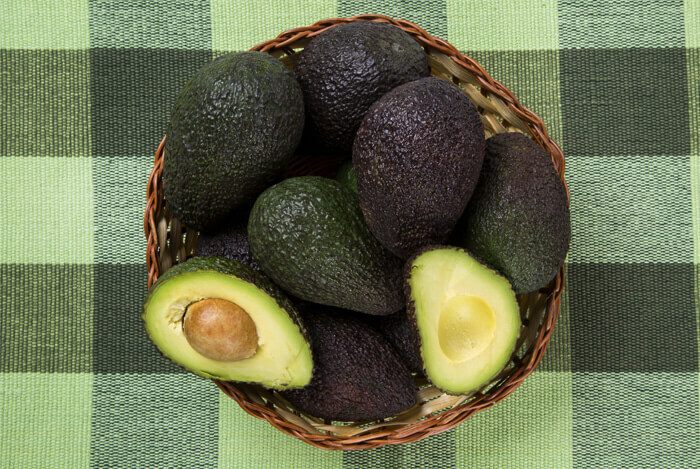 Potassium is an important electrolyte that helps balance sodium levels in your body, and has been shown to help lower blood pressure and have other heart-health benefits. Combined with whole grain oats and healthy fat from nuts, you have one amazing breakfast for your heart! Heat up the oats with water (or almond milk for a boost of protein and calcium), then top with banana slices, crushed walnuts, and cinnamon. Presto! Eggs are nutritional gold mines, packed with several important vitamins and minerals, and high in protein and healthy omega-3 fats. They’re one of the best ways to start your day! 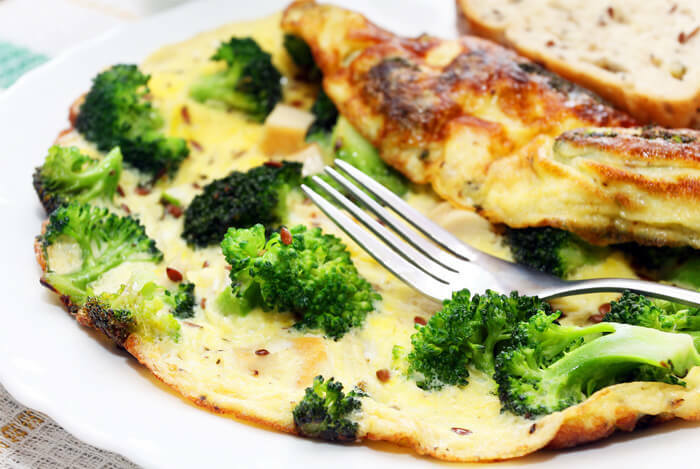 Omelets are easy to make – cook your eggs (1-3 will do the trick, depending on the amount of ingredients you’re using, as well as the size of your pan and your appetite), spread the other ingredients over the top, then fold the eggs over it all, enveloping your other ingredients. So why broccoli? 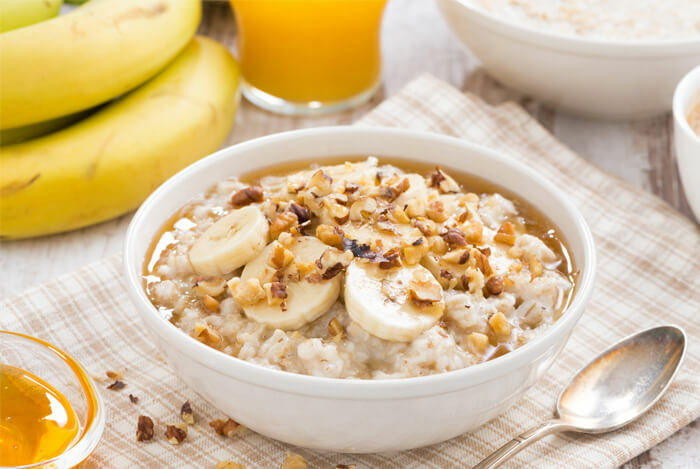 Well, just like with the banana oatmeal, starting your day with fiber is a great idea. Pair that with the high protein of eggs (and your favorite cheese) and you’ve got a remarkably filling breakfast that’ll provide you with long-lasting energy. 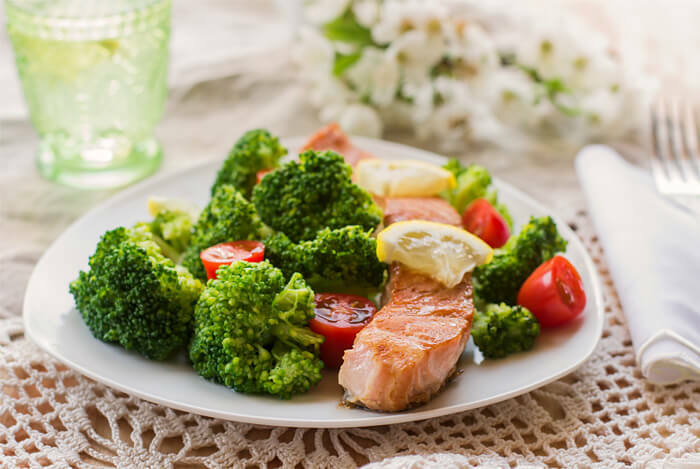 Broccoli is also loaded with vitamins and minerals, giving you a great one-two punch of highly nutritious ingredients (eggs and broccoli) right at the start of your day. Pair it with some whole grain toast and a glass of almond milk if you’re especially hungry for an even healthier meal. Greek yogurt is a great way to go if you’re craving yogurt, given its high protein content and lower sugar levels compared to regular yogurt. So why not take advantage of this filling protein by combining it with fruit (which adds vitamins and fiber) and mixed nuts (such as walnuts and almonds, which contribute healthy fats and more fiber)? Mix it all up! Why not just throw it all together in a bowl, cup, or plastic container, mix it with a spoon, and enjoy? It’s fast, it’s easy, and it’ll all probably end up mixed together by the time you’re halfway through eating it, anyway. Yogurt with style. 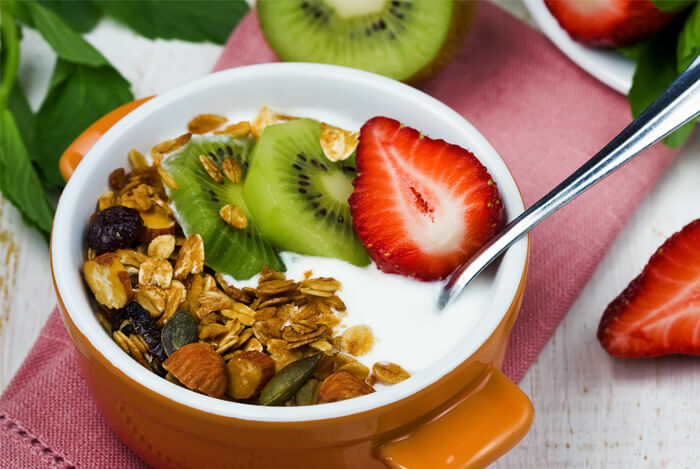 Go the classic breakfast route by throwing the fruit, nuts, and flaxseed all together on top of the yogurt. Then you can mix the ingredients together as you like while you enjoy the dish. Layers of sophistication. You can get a little fancy if you have the time and layer the ingredients together. Add about a ¼ cup of yogurt, then some of the fruit, nuts, and flaxseed on top of that, and then keep alternating back and forth. It’s a visually appealing result that ensures your taste buds stay interested the whole way through. This recipe really could work for breakfast, for lunch, or as a large snack, depending on when you want a blast of creamy yogurt and delicious fruit. Have it whenever you like! Sometimes even quick options like oatmeal and parfaits aren’t fast enough. You have places to go, things to do! You don’t have time to make breakfast. It’s times like these when smoothies come in especially handy. 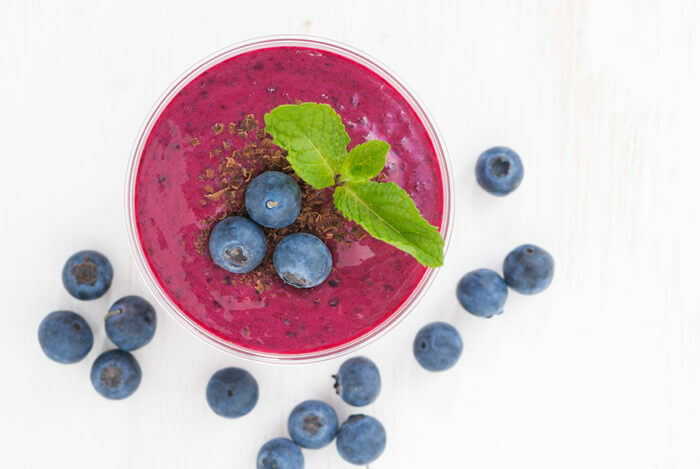 Being able to throw ingredients into a blender, mix them up, and then drink your smoothie at home or take it on the go is an invaluable option for busy people who are trying to eat healthy. That’s why I’ve included three different smoothie ideas below, giving you a variety of options for your on-the-go healthy eating needs. Take all of the ingredients, throw them in a blender, and blend for 30-60 seconds. Presto! You’re done! Pour it all into a glass (or a travel mug/bottle) and enjoy. The second smoothie on this list is a spicy alternative that uses cinnamon for an extra kick. 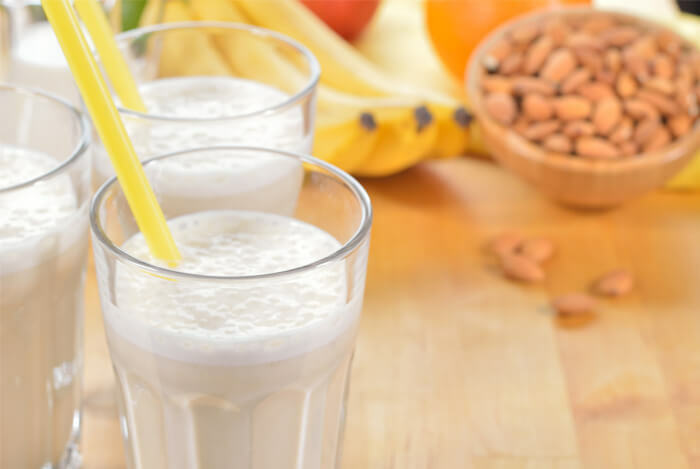 Greek yogurt, bananas, and almond butter all come together in this recipe for a filling and satisfying smoothie that’ll help you stave off cravings and keep you energized for hours. By a “pinch” of cinnamon, I mean that you should experiment to find the amount you prefer for your smoothie’s flavor. Start small – cinnamon can be stronger than you might expect in a smoothie – and then add more if you feel the need. Sometimes, you just want to get exotic with flavors and start your day with a citrusy, tropical punch to the taste buds. That’s where this next smoothie comes in, combining an array of flavorful fruits with greens and Greek yogurt to concoct a creamy blend that hits all the right nutritional notes. 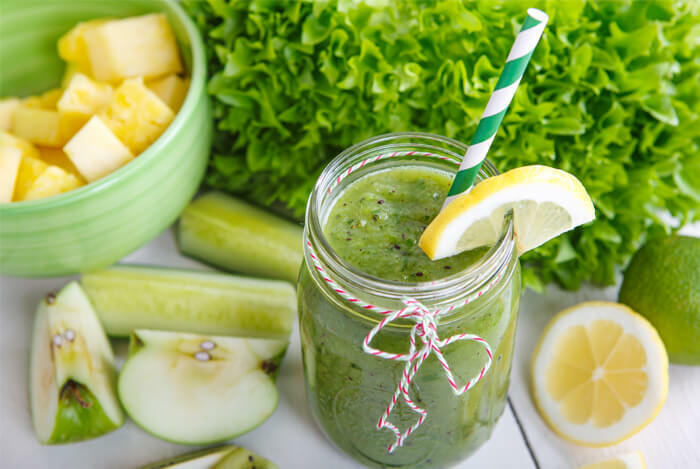 This smoothie is loaded to the brim with vitamins, minerals, fiber, and protein to give you an edge on the day. Blueberries are loaded with antioxidants (great for your heart), raspberries have more fiber than almost any other fruit, and all three berries used are very low in sugar. There’s also the combination of leafy greens. These veggies are high in fiber and vitamins, with kale being well-known as a “superfood” for its overload of nutritious value. One thing you may have noticed with the three smoothie ideas is that they all contain both Greek yogurt and bananas. The reason for that is two-fold. Bananas are high in potassium and fiber, while Greek yogurt is high in protein and low in sugar, so they both have high nutritional value. More than that, though, it’s about texture. Smoothies get their name from being, well, smooth. Homemade smoothies benefit greatly from bananas and the thicker texture of Greek yogurt (as opposed to regular yogurt) to give them their smooth, creamy texture. This is good to know for the sake of finding the texture that’s right for you. If you find your smoothie too thick, scale back on bananas and yogurt. If it’s too watery, add more yogurt and bananas. This knowledge will help you find your favorite way to make smoothies, giving your homemade concoctions that personalized touch that makes them better than anything you’d get pre-made at the store. The sandwich is a lunchtime staple. The simplicity of stuffing whatever ingredients you want between two slices of bread is part of the appeal, but that simplicity also makes it easy to put together healthy sandwiches using whole grain bread, your favorite meats and cheeses, and condiments that frequently have little to no calories. Begin by mixing the tuna, tomatoes, olives, and olive oil in a bowl. Spread that mixture inside the baguette, sprinkle spinach leaves over the top, and then cover with the other half of the baguette. Tuna is high in protein and omega-3 fatty acids (which have a variety of health benefits, from your hair to your skin to your heart). Tomatoes are plentiful in vitamins A and C, as well as heart-healthy antioxidants. Olives are great sources of iron and fiber, and their flavorful oil is full of heart-healthy fats. 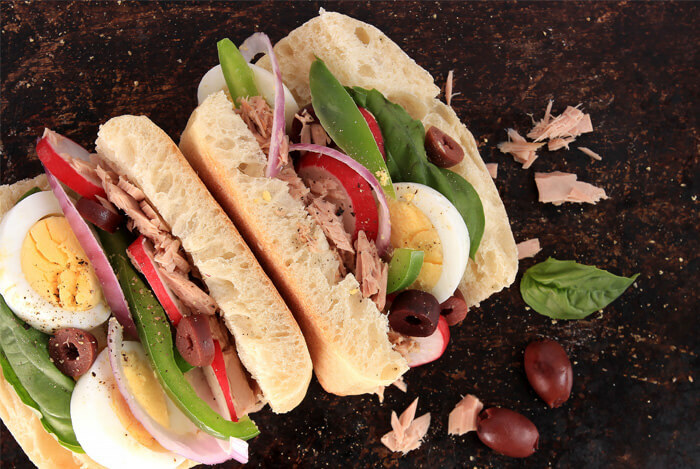 This combination of ingredients makes for a small, but filling sandwich, certain to keep you energized and focused throughout the day. Wraps have become a popular alternative to sandwiches, using tortillas instead of slices of bread, and folding in tons of meat, cheese, and veggies. 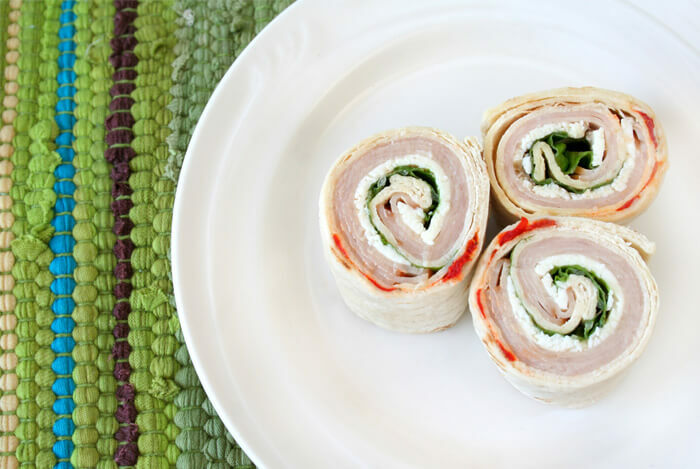 Roll the whole wheat wrap around it all, and you’re done! Turkey (and other poultry) is a great source of protein and healthy fats. Filling up the inside of the wrap with nutritious veggies and avocado (a fruit that’s strangely high in healthy fats and contains almost 20 different vitamins and minerals!) makes for a great low-calorie and nutritious snack. I know it’s going against the grain, but that’s what you have to do when you want to eat healthy all day long – you need to be creative or it can get boring fast. And with sandwiches, wraps, and similar items being common lunch staples, why not change things up by including fruit inside your sandwich? Cut into halves or quarters and enjoy! This makes having foods high in vitamin C important not just to start your day, but throughout the day as well. 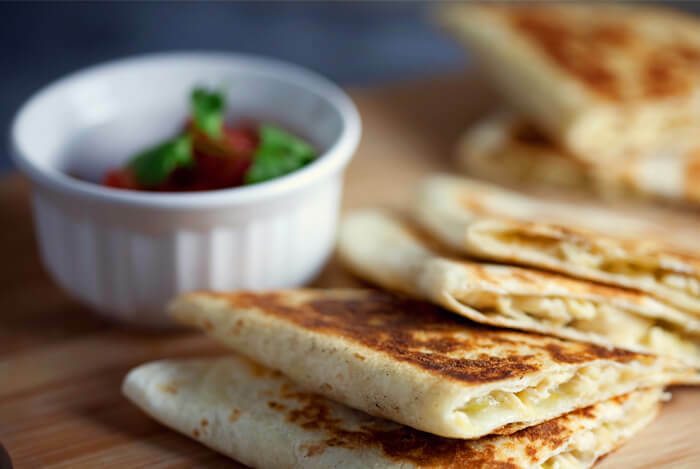 Mangos are a great choice and the above quesadilla is a positively delicious way to get them. Time to get into salads, which make great choices as between-meal snacks to keep your energy up, or as lunch and dinner meals, depending on your appetite and the size of the salad. The curry and cilantro really make this salad, adding a spicy zest you wouldn’t get otherwise. 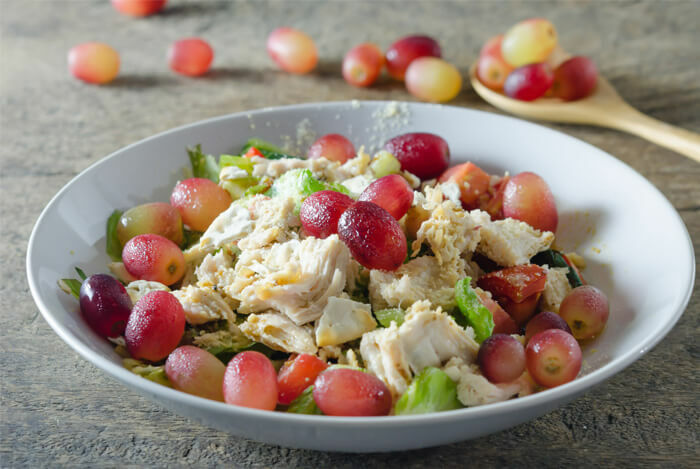 The overall combination of Greek yogurt, chicken, and a blend of veggies and grapes makes for a filling and nutritious salad that can function as a meal or a snack, depending on your appetite. Pinto beans are a great source of protein and dietary fiber, both of which help you stay full longer. While this salad requires some cooking, it keeps well, so preparing it in advance and taking it with you in a plastic container is a viable option for busier schedules. Eggs are a staple of breakfast, where they can be cooked in so many different ways, but don’t ignore their uses in dinner dishes, as well. One thing you’ll find with these dinner selections is that there’s more cooking involved. Don’t worry, though – you can always prepare dishes in advance if you don’t have time to cook dinner each night, and then just reheat them when you want them. 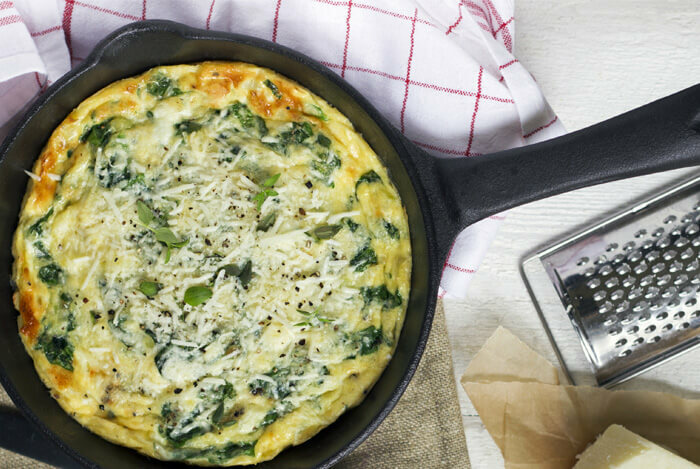 Once it’s finished and cooled, cut the frittata into slices like a pizza and eat it that way. Delicious! Now, slow-cooked recipes take hours to cook. So why is this one on a list of “quick” meals? 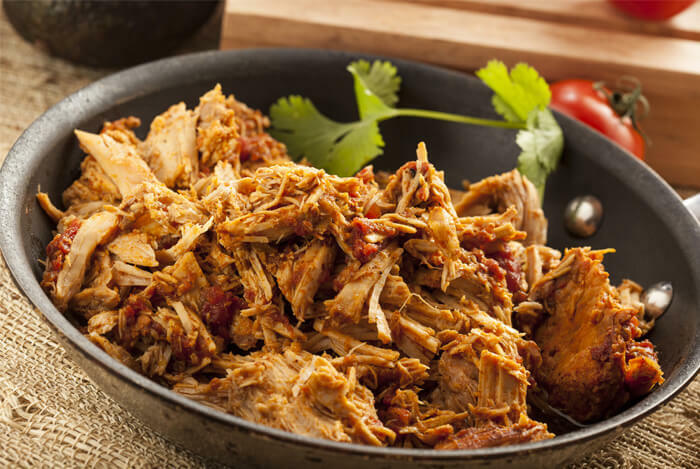 Simple: slow-cooked meals make large quantities and store well. This means you’re making several meals ahead of time that’ll be ready for you to eat whenever you want. Planning ahead is a vital part of having healthy meals on deck that are quick to prepare. Pork is high in B vitamins and protein, and surprisingly low in fat, making it a great choice for mixing it up from standard “healthy meat” suggestions like chicken breast and salmon. This will make several servings (depending on your appetite), and you can easily store servings in plastic or glass containers for easy reheating later. Overall, this meal contains the highly desirable combination of protein and fiber that makes for a filling and satisfying meal. Enjoy! And that’s it! You can enjoy this dish with whole grain rice or quinoa (hint – add lemon if you find the taste too fishy for your liking). Both of the dessert options included here are simple and easy to prepare, thanks to a preparation method that involves dipping fruit into something else to make it sweeter and even more delicious. 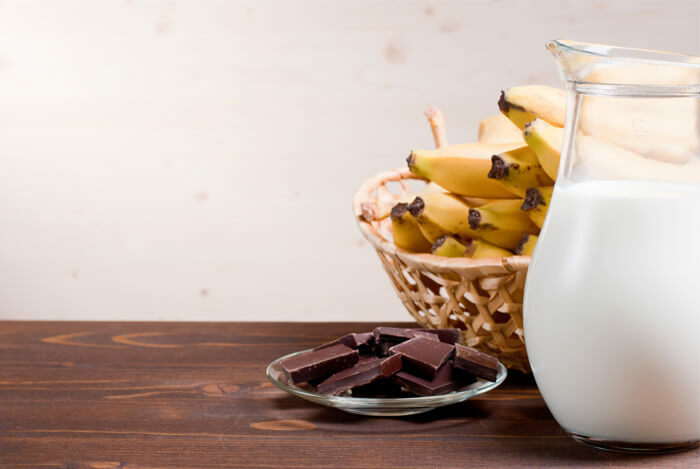 For the chocolate-dipped banana bites, first slice one banana into seven to nine slices, depending on the size of your banana. Then, take two tablespoons of dark chocolate chips, place them in a microwave safe bowl, and microwave on high for one minute or until the chocolate is melted. Dip the banana slices into the melted chocolate and enjoy! You can eat them right away, or refrigerate so that they harden a bit first. If you’re not feeling the chocolate cravings – or if bananas just aren’t your style when it comes to fruit – this dipping recipe is a great alternative (and it’s high in protein as an added bonus!). All it takes is two cups of strawberries (sliced into halves), one cup of vanilla Greek yogurt, and wax paper. Using a fork, dip each strawberry half into the yogurt, and then place on the wax paper with the flat side down. 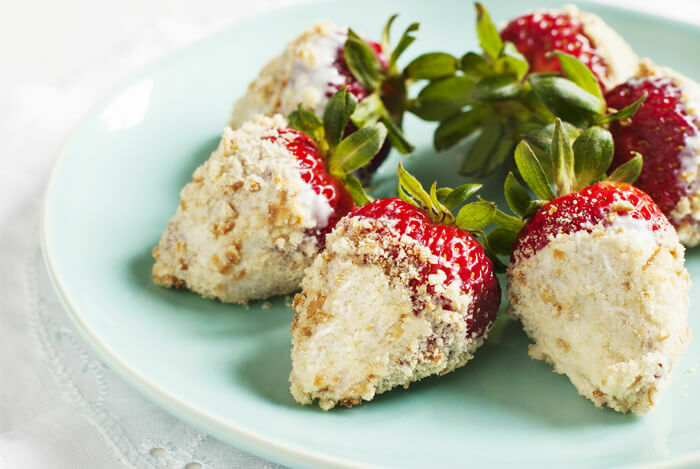 Once all of the strawberries are coated, place the wax paper in the freezer for thirty minutes. After the thirty minutes are up, remove the wax paper and place the strawberry halves onto a plate. You can eat them with a fork or your fingers. Strawberries are one of my favorite fruits, and vanilla Greek yogurt is delicious and creamy, so this has always been a favorite of mine for healthy desserts. I hope you enjoy it as much as I do! What’s your take on these healthy recipes? Have anything else you’d like to share? Let me know in the comments below!